The linocut ‘Blue Mountains Wildflowers’ is really a step back in time for me on many levels from the design inspirations to my memories of this region. As I’ve spoken about before I love the Blue Mountains region west of Sydney, it has such a rugged beauty & the flora & fauna is integral to the whole region. The Blue Mountains has a strong Art Deco influence in architecture and design & examples of that can found throughout the small villages along the ridges leading all the way to Katoomba & beyond. The area really had its ‘heyday’ in the 1900-1960’s and in particular the 1930’s. This linocut art piece is also grounded in family experiences & an inheritance of sorts. I guess this artwork had its beginnings with family. Both my family & my husband’s family have been keen visitors to the Blue Mountains for many years. When thinking about the Blue Mountains region I found I had so many stories & photos of that time from my mother-in-law & her family in particular, many of whom still live in the Blue Mountains. From honeymoons to day trips and in fact, it is where my husband & I had our honeymoon. It was also somewhere we took our kids for day trips, holidays & to visit family & friends as well. The wildflowers of this region are truly spectacular. The waratahs & flannel flowers are two of the iconic Australian wildflowers found here & of course I could not go past the ‘Mountain Devils’ – Lambertia formosa – which I have childhood memories of the seedpods dressed up with tulle on sticks like cupie dolls but there are some more vivid examples of these dolls in this newspaper article! I actually still have a couple of my mother-in-law’s tulle simple versions in an old china cabinet from her ‘nic-nacs’ which I just haven’t been able to part with. So the central panel of this work for me just had to be these three wildflowers. A lot of research goes into investigating the species of an area, then I always take my own photographs & drawings of each of the species. This helps me to understand the structure of each plant & flower & increases the draftsmanship & design of the piece. There are usually so many I then have plenty to choose for the design. So a little gallery in of inspirational wildflowers for Blue Mountains Wildflowers. When my mother in law passed away a few years ago we inherited an old Art Deco style mirror. Looking a little shabby & worse for wear it does however have such an interesting shape. So I started with the mirror’s shape then developed that to create the overall structure of the design. It is then a matter of putting together all the research & developing that into the design. I spend a lot of time drawing, I think it is one of my favourite parts of the process. I have always loved drawing. I see the linocuts as an extension of that & a way to push my vision & drawing further – the art of creative-art thinking. There is the ‘practical’ aspect of what can actually be carved out of lino but then there is the creative side of shapes & patterns. After I have finished the drawing of the design I then photocopy it several times & start to work on the actual linocut design. I use black felt pens to work on the designs, often photocopying, pasting & then using white out to work on this side of the designing. I guess I am still ‘old school’ in that I love to work with the physicality of paper, pen, pencil & ink but I do sometimes ‘dabble’ with computers & photoshop. I can spend weeks refining the images into exactly what I am happy with in the design & which I am able to produce in the medium. Then to the carving of the design in lino. I have talked about different type of lino previously but I am pretty settled with the grey Silkcut & even managed to visit their gallery & workshop in Melbourne when I was there last time. I love my new Pfeil linocutting tools as they have made the carving just so much easier reducing the strain on my shoulder. There are actually 12 different blades in my set & I think so far I have only used half of them! Like a painter may use different brushes a Fine Art linocut artist uses their carving tools to create different effect within the surface of the lino. Some use it to create rough textural pieces but mine is a more methodical approach. I see my linocuts as botanical in nature so I try to represent the wildflowers as close to their essence as I can and this includes within the carving to create the images. An interesting aspect to my work is the ‘uneven’ edges. I do not feel limited by the square or rectangular shapes that lino is usually presented to us from the art shop. I have always sought to move outside these shop bought restrictions. In order to do that I need to carefully cut back the edges. I start by making several strong cuts into the from surface of the lino. I then very carefully split the lino edge I want to remove & fold it towards the hessian back. Then I turn the lino over & cut along the hessian backing with a sharp bladed knife. Often there can be a rough edge which is not something I want to be on my print. So I carefully remove the rough edges until I have a clean smooth cut. You need to take care especially around pieces with more ‘organic’ lines rather than the straight edges within this particular design. Then the handcolouring. I print with oil-based ink & handcolour with watercolour. I like that I can sue multiple layers & colours within each section to create the overall vibrancy of the wildflowers. You will see on the first ‘handcolour proof’ patches of colour & notes on which colour mixes I used. Although the aim is to paint each one the same you can appreciate that each one is actually individually painted & there are always variations. Here is a little video from photos about this whole process of creating Blue Mountains Wildflowers. For those who don’t want to read explanations & learn better through images rather than words, you can now watch it in a little video format. 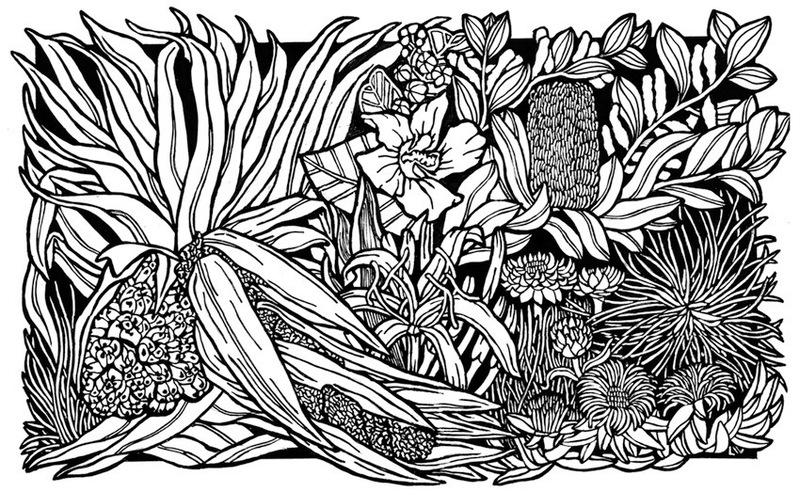 The centrepiece artwork for an exhibition at the Northern Rivers Art Gallery was a new linocut – Seaside Wildflowers. Back in February I was approached by the Northern Rivers Art Gallery Director Ingrid Hedgcock, to exhibit alongside an exhibition of the Master Woods Craftsman & his students. For me it came at a time when recently becoming an ’empty nester’ & my shoulder was looking like it was going to recover after surgery & allow me to work – carve – again. It was also when I really need to get my arts practice back on track after a few years of life being too hectic to gain a consistent approach to my work. I made the decision that I would work on finally completing many works I had been developing over many years as well as creating the centrepiece for the exhibition a work based around the Wildflowers synonymous with Ballina. I will talk more about the other works in the exhibition in future posts but will start with the Seaside Wildflowers & where it all began. In the process of creating this work I took some video footage & sill photographs with the idea of creating an education video showing my process from the inspiration through to the completion of the artwork. I have always loved the seaside – the beach, the rock formations, the sea, the wildlife & of course the Wildflowers or flora. Even though I grew up in Sydney we spent every holidays by the sea at my grandparents in Yamba. Woody Head was another favourite place where my great uncle & Aunt lived, it is a truly beautiful natural place. We also spent a lot of time over where I now live on the ‘plateau’ region behind Ballina with my other grandparents – not that far from the seaside. As kids we would spend many hours going to the beach but also exploring the surrounding landscapes. So I know this region really well. I start this particular genre of my work with research – some of this is ‘formal’ – flora studies of regions, plant identification lists but also I go & spend some time wherever possible wandering around the region taking photos. I like to see the flora/Wildflowers I am going to be drawing & document that in my own photos. By taking my own photos it also give me the opportunity to explore the process of visualising each wildflower or plant & how & where that might be represented within the initial concept of the artwork exploring different images of the particular plant. I look at things like the structure, colour & overall impression of each. As I have talked about before, my work starts with ‘flashes’ of ideas scribbled into small sketchbooks, on post it notes or on scraps of paper. For Seaside Wildflowers it began as a quick sketch on a post it note which I have now stuck into one of my small sketchbooks with additional notes & ideas. For this artwork I have drawn on the flora lists of the region, the council guides for flora in the Ballina Shire, books of flora of the region, my own explorations of the Ballina seaside region, my own photographs of specific species & finally my memories of childhood holidays alongside living in this region for over 20 years. One of my abiding memories of the flora or Wildflowers of this area is the stunning Pandanus – Pandanus tectorius or Screwpine. These strong ‘structural’ small trees are integral to my childhood memories & they are such a strong presence along the seaside of this region. The fruit which starts as a small green ‘ball-like’ structure & slowly moves to yellow tones & finally a vibrant orange colour is the aspect most people would recognise. For me the depiction of the pandanus would need to include the fruit. Less obvious for many people are the flowers – many would not be aware of the flowers. So I made the decision to make the ‘wildflower’ front & centre for this piece. The flower starts as cream bracts inside which the flower heads develop but the slowly the whole long spike of flowers emerge with the female flowers ending in long spikes of cream flowers & bracts. The long strap like leaves emerge in a spiral from a central point & form a cluster on the end of the rather tortuous trunk & limbs. I think the pandanus reflects the very nature of growing by the season it’s tough ‘wildness’ & so it was for me to become the pivotal image for this artwork. I started with many possible flora species I could incorporate into the piece, more than I could actually use & so this is where after setting out the pandanus I explore the size, structure, colours etc of all the possibilities. I see this is the fine art aspect of developing my Linocuts – this is where my training, skill & inspiration as an artist rather than a craftsperson comes into being. I bring my drawing & compositional skills to this process & it can be both the most frustrating as well as enjoyable part of the developing of my artwork. Once I finish the detailed drawing I work through further developing this drawing into a form that can be carved in Lino which is my chosen medium for this piece. For me this involves inking the design into shape & spaces. I then carve this into Lino to be printed. For me these two further processes again involve choices & changes in the translations from drawing to final artwork. A fine bladed gouge is used to carve – these are extremely sharp so beginners be aware! Once the Lino is finished being carved I then print it in black ink & handcolour with watercolour the final artwork. The hand colouring is not simply a ‘fill in the spaces’ it involves again skill & training in watercolour as a medium including colour, contrast, tone etc alongside the application of the paint. I have taken some video footage of the processes which is a quick look at the whole process and it is now on youtube.